Fujii’s fellow countryman Narazaki Kosuke was also amongst the winners, taking race 5 on Raon Birdie (Al Naba), was was South African Gerrit Schlechter who rode the Peter Wolsley trained gelding Cheongchun Bulpae (Milwaukee Brew) to a very comfortable win in race 8. Punters will need to stump up an extra 200 won to get into the track from this weekend as the Korea Racing Authority raises the admission fee to the three racecourses for the first time in ten years. The new fee of 1000 won will also apply to all off-track betting facilities. More on that less than Earth-shattering news in a little while but given that it’s still cheaper than a basic subway fare, it is perhaps safe to assume that most punters won’t notice – especially as most use their subway card to get in. KRA Cup Mile winner Gyeongbudaero (Menifee) makes his first appearance at Busan since running third in the Korean Derby just over a month ago. The colt goes in the second of co-feature races at the southern track on Sunday afternoon against a field of eminently beatable older horses over 2000 metres. Among them is Peter Wolsley’s old warhorse Khaosan (Sunday Well) and Wolsley saddles another fancy in the earlier co-feature as Secret Whisper (Sea Of Secrets) takes on a very competitive field over 1400 metres. Up at Seoul there aren’t any stars on show altough both Saturday and Sunday’s feature races are competitive class 1 handicaps. There’s another new Japanese jockey on the South Coast. 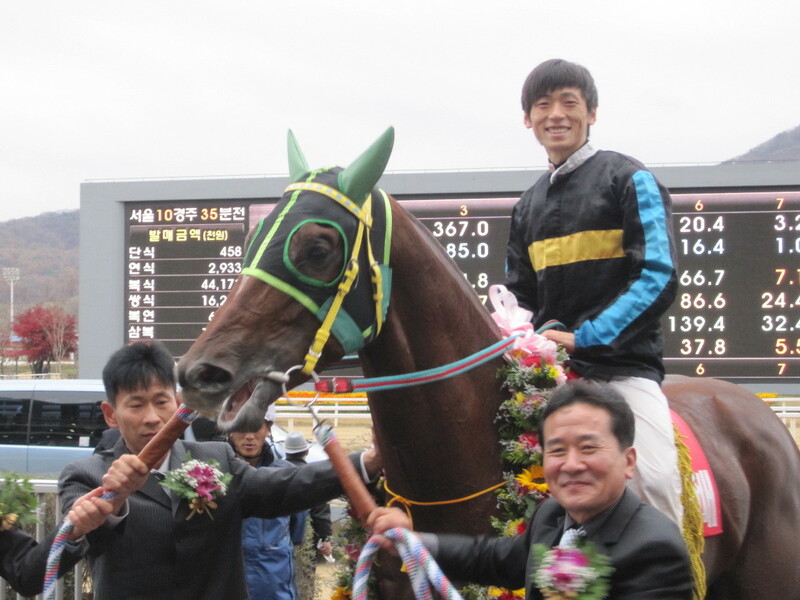 Kanichiro Fujii will have his first rides at Busan Race Park this coming weekend. Fujii – who goes by Joe – was born in Nara, Japan but went to Australia at the age of 15 to train as a jockey. He debuted in 2001 and spent the next five years riding mainly in New South Wales, finishing 2nd in the State’s Apprentice Jockey race in 2006. 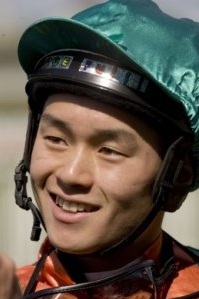 In 2007, Fujii spent nine months in Singapore where he won the Listed Chairman’s Trophy and rode third-placed finisher Jade in the Group 1 Emirates Singapore Derby. After Singapore, Fujii went to Europe where he rode work in France for, amongst others, Criquitte Head before returning to Australia in 2008. In 2009 he went to the USA and rode work at Belmont Park before relocating once more to Australia, this time to Queensland where he has been riding until recently. To date, he has ridden just shy of 300 winners. Fujii is married and became a father for the first time earlier this month. Riding on an initial four-month license and joins fellow Japanese riders Narazaki Kosuke and Yukio Abe as well as South African Gerrit Schlechter in making up the foreign jockey contingent at Busan. He will make his racing debut this Friday in race 7. He told Korea Racing that he became interested in riding in Korea after speaking with Japanese riders Nozomu Tomizawa, Yoshi Aoki, Hiro Hamada and Akane Yamamoto – all of whom rode in Korea and have strong Australian connections, as well as Aussie jockey Garry Baker who rode at Busan from 2005 until 2007. 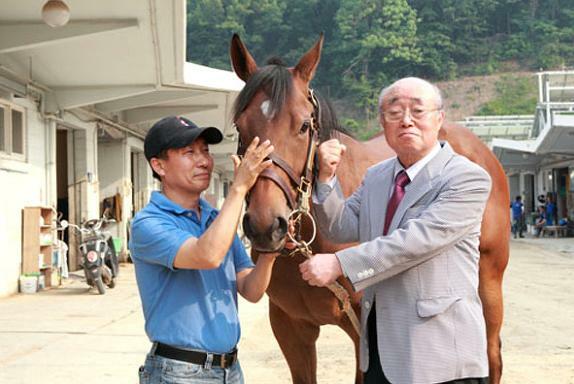 The most expensive imported racehorse in Korean history has arrived at Seoul Racecourse. The filly, by Henny Hughes and out of the Cape Town mare Cape Discovery, was purchased by owner Oh Ho Kuk at the OBS Spring Sale of Two-year Olds in Training in Florida this April. Having cleared quarantine, she arrived at the track earlier this month. 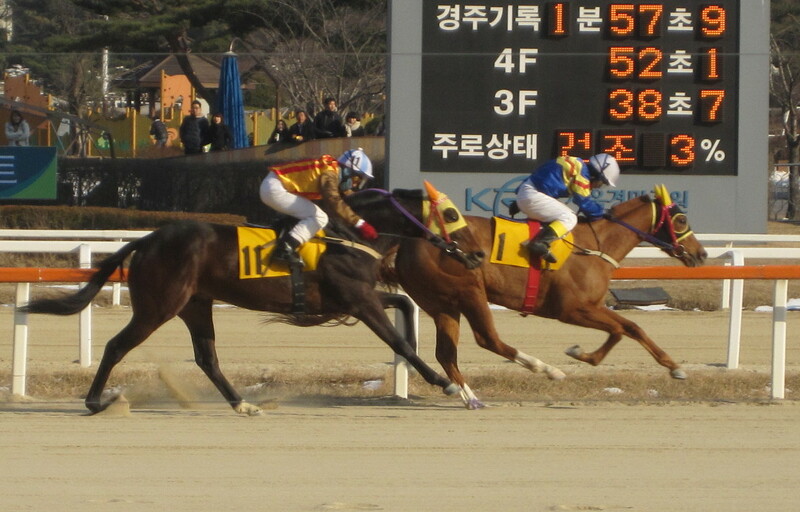 The filly, who remains unnamed, was the fastest under-tack in the lead-up to the sale, posting a time of 9.8 seconds for 1 furlong – considerably faster than anything has ever run in Korea. According to The Bloodhorse, family members include G2 winners Unbridled Energy and Heart Of Joy and G3 winners Inexplicable, Midnight Cry and White Mischief. The filly is by far the most expensive purchase made by a Korean buyer since the price cap for imported fillies was removed on a trial basis earlier this year. The cap, which existed to promote the local breeding industry, had been increased in recent years from $20,000 all the way up to $70,000 before being removed completely in order to provide not only a better standard of racehorse but also to improve the breeding stock. Great news for OBS and others who already see the lower end of their sales propped up by Korean buyers but also, the Korea Racing Authority hopes, for the nation’s own breeders. The cap remains on colts and geldings, however, with the breeding industry here now sufficiently developed in terms of facilities and well stocked with an ever-improving standard of stallion, the KRA believed that the time was right to remove the cap for fillies for racing (mares imported solely for breeding purposes had never been subject to the cap). To encourage the import of quality fillies, the “Queens’ Tour” of valuable Stakes races was introduced this year. The KRA wants Korea’s breeding industry to develop to such an extent that ultimately the country becomes a net exporter of racehorses. Last year, several horses were sold to Malaysia and ultimately Korea, like every other country in the region (and most of the world) has its eye on China as an export market if and when they begin importing horses. Of course, on the track the challenge remains for these expensive fillies to be able to live up to their potential as Korean training remains significantly below international standards. 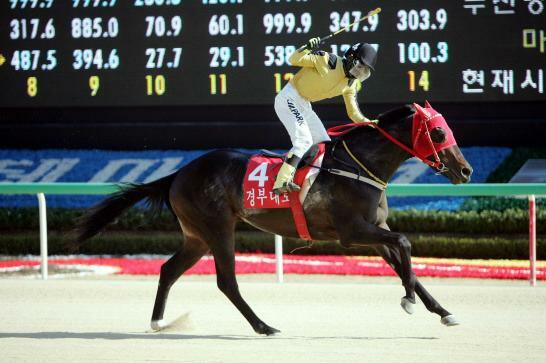 The Henny Hughes filly has been sent to the barn of Choi Bong Ju who, although 49, has only been training since 2007 after retiring as a jockey. Choi told the media that he “doesn’t feel a burden” in being put in charge of the star newcomer. Likewise owner Oh has insisted – publicly anyway – that his trainer is under no pressure. We will see. Haedongcheonwang announced his arrival among the elite at Seoul Race Park today as he cruised to a six-length win in the MBN Cup. One of the most highly rated three-year old imports in Korea, Haedongcheonwang was surprisingly beaten in the JRA Trophy last month. However, he made no mistake today as he left the rest of the class 1 MBN Cup field trailing with a sharp burst of acceleration at the top of the home-straight. Filly Kkochyeoul, who had set the early pace, was second while old-stager and outsider Mr. Loving Life finished third. Haedongcheonwang moves on to five wins from seven starts and is looked on by some as a possible challenger to Smarty Moonhak, currently the most exciting horse at Seoul, later in the year. That is a little way off and at the moment Smarty Moonhak would definitely have the edge. However, on today’s form, if Haedongcheonwang continues to improve, he is going to be very dangerous. Down at Busan where it was just as hot as the sweltering capital, there were co-features races. The first of those saw an eye-catching win by Pokpung Jilju (Greatness). The US bred four-year old led from gate to wire in the 2000 metre handicap to score a twelve length win. The second co-feature was a 1300 metre sprint and it was a slightly closer affair as filly Haengunui Mannam (Creek Cat) landed victory by just under a length from Money Hunter (Golden Missile). It was a surprisingly quiet day on the foreign jockey front with only Yukio Abe recording a winner. Gerrit Schlechter had recovered from the sickness that ruled him out of all but the first of his rides on Friday, however, the South African didn’t come close to a winner today. Next week, Stakes action returns to Seoul in the shape of the Sports Seoul Cup, the track’s primary trial for the Korean Oaks which will be run at Busan in August.